Chennai: Dr Bala V Balachandran, Founder, Chairman & Dean, Great Lakes Institute of Management, Chennai along with Mr. Shailendra Tipparaju, Serial entrepreneur, Founder – Colosseum Group today announced the launch of their book – ‘Reflections .. on Living, Loving and Working’ at Great Lakes Campus located in Manamai, ECR. 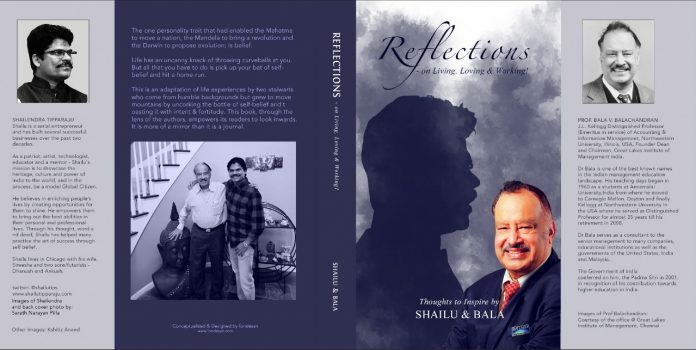 Published by Fondessan, Book ‘Reflections’ is an adaption of life experiences by Dr Bala and Mr Shailu who come from humble backgrounds but grew to move mountains by uncorking the bottle of self-belief and toasting it with intent & fortitude. This book, through the lens of the authors, will empower the readers to look inwards, as it more of a mirror than a journal. The book launch also saw an interesting talk on ‘7 Steps to Build Intelligent Enterprise’ by Mr. Surendra Tipparaju, Principal AI Architect in Data and Artificial Intelligence (AI) Domain, Microsoft. The talk presented a step by step approach to build an intelligent enterprise based on evidence & learning derived from working with various enterprises across the world at various stages of readiness to adopt AI. When an eighty something year old and a forty something year old put their minds together, time stops and magic is created. Among many of the delightful and futuristic thoughts we were able to incubate, we also hit upon the idea of a book. This book is not your edge-of-the seat thriller or a run of the mill entertainer. In the following pages, you will find, thoughts, ideas, moods, emotions, suggestions – if you will. The book is to be read a few pages/thoughts at a time, somewhat like the ‘Chicken Soup for the Soul’ series (although ours is way more colourful and contains far less narrative!). Assimilate the contents of those few pages and ruminate. You’ll also be pleasantly surprised at the universal applicability of the ‘ism’s that appear in the following pages. Furthermore, depending on your frame of mind, you will find different perspectives and interpretations too. There is something for everyone. You will be able to identify with much of the material in the book. Its beauty lies in being able to take you back in time to cull out so many memories to which you will surely be able to relate parts of the book! Prepare to be transported back in time to relive the experiences of your childhood, arguments with friends, precious moments with loved ones, duels with rivals, exhilarating wins, crippling losses – any memory that your beautiful mind has stored away in the hope that one day, some meaning may be derived from that specific experience. Wisdom and absurdity, experience and naïveté, brain and brawn, emotional maturity and youthful exuberance, values and attitudes – are all beautifully juxtaposed in a stimulating panorama of colour and text presenting a veritable feast for the eyes and ears. After all, we did promise you magic! We are different; we make the difference and here in the pages of this very book, we deliver to you, the difference! I sincerely hope you enjoy reading the book every bit as much as we enjoyed putting it together.